Harvest Moon Acres Corn Maze & Fun Park is pleased to be able to offer a wide range of attractions that are fun for the whole family! These attractions are also ideal for school groups, church groups, scouting groups, reunions, and more! "Get lost" in our Corn Maze adventure! Try our Giant 5-Acre Corn Maze featuring a new theme each year! It's a maze, it's a game, it's educational, and it's FUN! 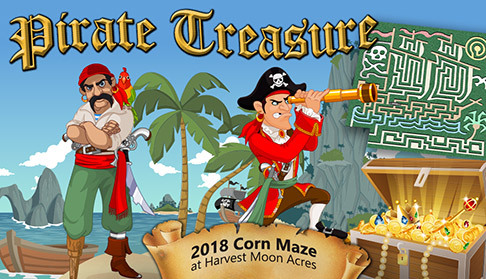 The 2018 Corn Maze theme is "Pirate Treasure." Ahoy, mateys! Take to the high seas of the Golden Age of Piracy to discover the history and surprising customs of the Pirates of the Caribbean. Wind your way through our giant pirate ship corn maze while learning all about this exciting time. Relax and have fun making new fall family traditions. Sit back and enjoy a hayride through twenty acres of Michigan's fall beauty. A hayride is included with the purchase of a maze ticket at no extra charge. Plan on choosing the perfect pumpkins for carving or fall decorating at Harvest Moon Acres. We supply a large variety of pumpkins, gourds, squash, and more. Pumpkins and decor are additional to the park admission fee. Don't miss out on the rest of our outdoor fun - including the Cattle Castle, Harvest Moon Saloon Shootout, life-size Barnyard Boardgame, Zip Lines and more! Fun abounds in our Indoor Fun Barn - featuring our Interactive Farmers' Market and Corn Bin. Come meet our animals! Our animals are friendly and fun to observe! Our friendly farm animals include goats, chickens, bunnies, and more. Observe and learn through getting to see the animals outside and up close! Hungry? Enjoy delicious snacks and drinks from our concession stand! Lunch items are served including hot dogs, soft drinks, caramel apple slices, apple cider donuts, and other tasty treats! Don't miss the crowd favorite at Harvest Moon: apple cider donuts - available plain, with cinnamon sugar, or iced! The perfect ending - Bring your group at night and enjoy your own private campfire. After you finish the maze and enjoy our other attractions, relax out by the campfire in the country. A campfire in the fall is a great way to spend an evening or warm up on a cool night.